On November 13, 2015, we received the sad news that our friend and colleague, Robin Bellinder, professor of Horticulture at Cornell University for 31 years and an international expert in weed control in vegetable crops, died unexpectedly. She was 70 years old. Robin died of a pulmonary embolism after a brief hospitalization and stay in a physical rehabilitation clinic for an unrelated spinal injury. At Cornell, Robin’s research program focused on weed management for vegetable crops. One of few women in her field at that time, she became a national and international leader. She published research results widely in peer reviewed publications, as well as publications that advised growers about her work’s practical applications. 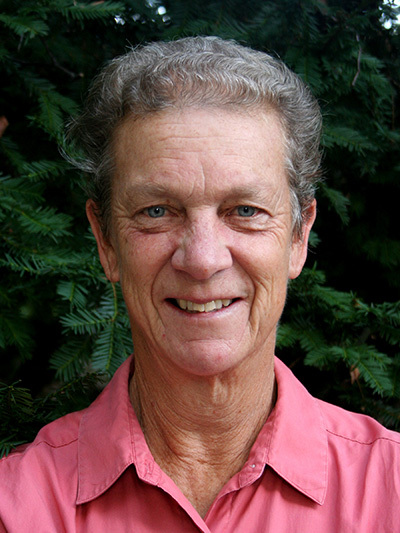 She served as president of the Northeastern Weed Science Society and, in 2005, was named the recipient of Cornell’s College of Agriculture and Life Sciences award for outstanding accomplishments in applied research. She will be remembered as a weed scientist who ardently and tirelessly supported New York vegetable growers. Robin had a deep concern for people, whether farmers in South Asia, for whom she championed the introduction of more efficient weed control practices, or hungry families in New York’s southern tier. She initiated Cornell’s efforts to provide fresh fruits and vegetables from the Homer C. Thompson Research Farm to the Food Bank of the Southern Tier. She realized that rather than composting the farm’s edible produce, they could feed hungry area families. Since 2004, as a result of her initiative, Cornell has donated almost 2 million pounds of produce. Robin will be remembered as an intense, thoughtful, loyal, generous, creative and loving person who tenaciously advocated for the things she believed were important. Mentoring students and seeing them become leaders around the world provided Robin with great satisfaction. At the urging of her colleagues, Cornell is proud to announce the establishment of the Robin Bellinder Graduate Student Fund. The fund will be established “to provide financial support for graduate students working on vegetables crops, with a preference given to projects with a weed science emphasis. The fund will be distributed at the discretion of the chair of the horticulture section, and may be used to supplement travel or research expenses for the successful candidates”. Thank you for your support of the Robin Bellinder Graduate Student Fund. Climate change has become a huge topic of discussion lately, especially following an international agreement on how to combat the problem. But here in New York, Cornell University is taking a different approach. They’ve created the Cornell Institute for Climate Change and Agriculture to help train and educate farmers on how to adapt to a changing climate and reduce their impact on the environment. 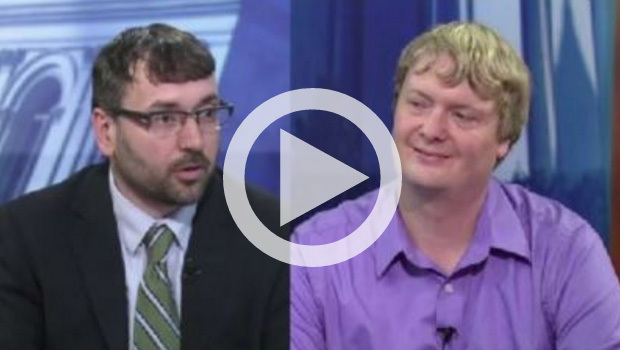 Cornell’s Matt Ryan and Neil Mattson joined us to talk about the initiative. 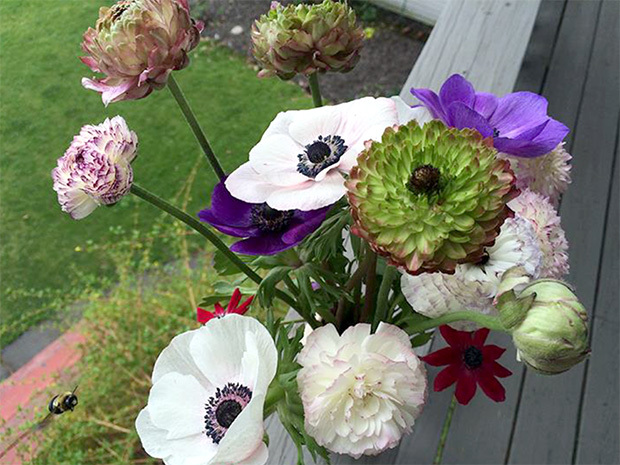 Ranunculus and anemones from the trials. If you missed the painting with soils activity organized by the Soil and Crop Sciences Section to celebrate World Soil Week Dec. 10, you can watch a one-minute time-lapse video to see what you missed. Read more about the event in the Cornell Chronicle. 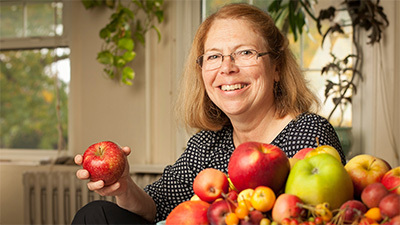 A Harvest, Sweet and Plentiful [cornell.edu feature] – Susan Brown, Herman M. Cohn Professor of Agriculture and Life Sciences and the Goichman Family Director of the New York State Agricultural Experiment Station, helps create fruits and vegetables that benefit consumers and the state’s agricultural economy. The Outsize Importance of the Tiny Organic Seed [Modern Farmer 2015-12-15] – As agriculture has become more and more industrialized, flavor and genetic diversity have been sacrificed in favor of efficiency and yield. The result, says Cornell plant breeder Michael Mazourek, is the bland, “one-size-fits-most crops” that dominate today’s culinary landscape. Vegetables Under Glass: Greenhouses Could Bring Us Better Winter Produce [NPR 2015-12-09] – Even though growing vegetables in greenhouses is usually a bit more expensive than open-air production, Neil Mattson says that indoor farming’s key advantage — the freshness of its produce — may outweigh cost for many consumers. New York wine varietal debuts [Good Fruit Grower 2015-12-17] – Goose Watch Winery became the first in the nation to offer the new wine varietal Aromella, and it did so just a year after Cornell initially released the grape in 2013. 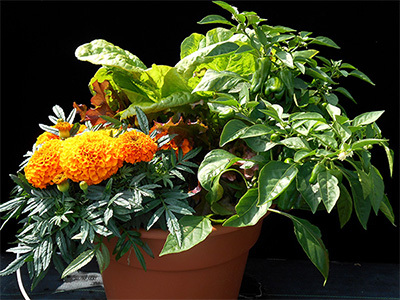 This successful mixed container combined ‘Sweet Heat’ pepper, ‘Taishan Orange’ marigold, ‘Summer Picnic’ lettuce. If you missed last summer’s Cornell Floriculture Field Day held at the Bluegrass Lane Turf and Landscape Research Facility adjacent to campus, you can still view 2015’s top performing annual flower and foliage plants and the results of mixed container trials combining vegetables, ornamentals and herbs. And mark your calendars now: The 2016 Cornell Floriculture Field Day will be held August 9, 2016 at Bluegrass Lane. 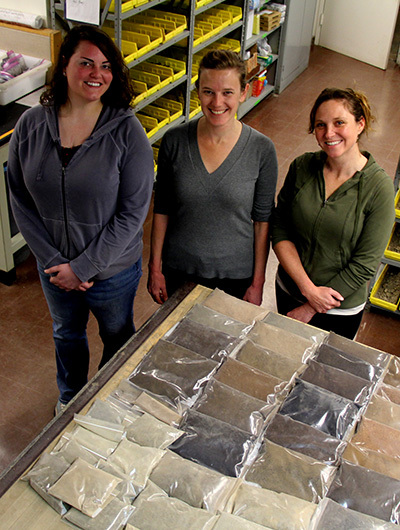 Aubrey Fine, Kirsten Kurtz and Kelly Hanley prepared the soils to make the paints. Need a study break? 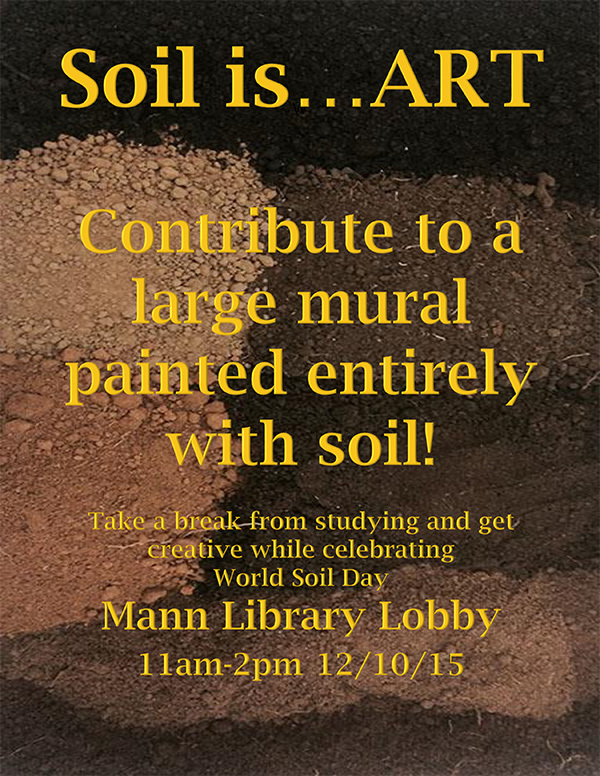 Swing by the Mann Library Lobby on Thursday anytime between 11 a.m. and 2 p.m. and contribute to a mural created with paints made from soil. 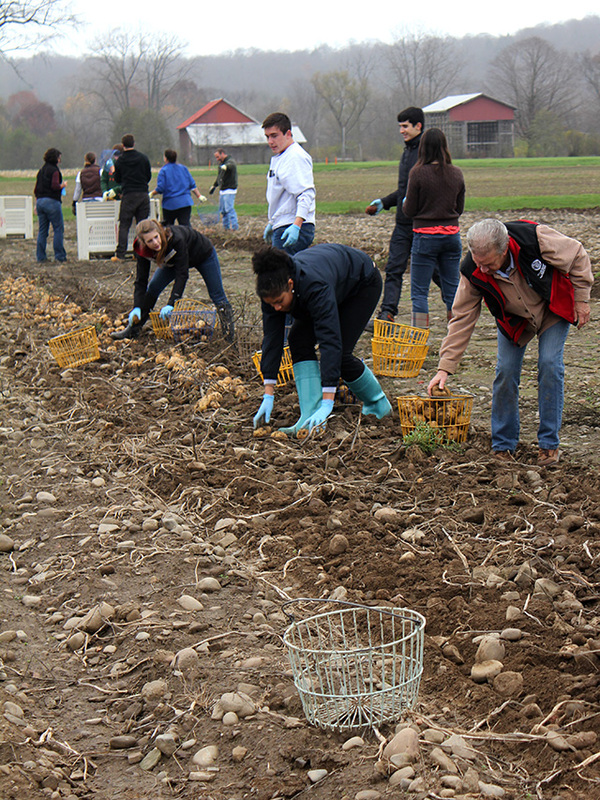 “To celebrate World Soil Week this year, we thought it would be appropriate to do something fun and help relieve a little exam-time stress,” says Kirsten Kurtz, manager of the Cornell Soil Health Testing Laboratory who spearheaded the project. Kurtz is an artist herself who has experimented in the past with extracting pigments from soils to make paint. Last weekend, she and volunteers crushed and sieved soils ranging from light tan to reddish brown to near black. If you join in Thursday, part of the activity will be turning those soils into paint. “Or you can just grab a brush for a few minutes and help us fill the in the scene we’ll have sketched out on the canvases,” says Kurtz. Ming-Yi Chou is a Ph.D. student in the Graduate Field of Horticulture. 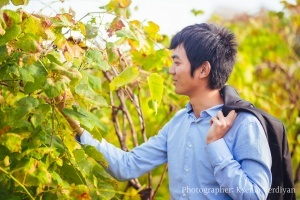 At Cornell, his work examines floor management impacts on grape composition and wine sensory properties through physiological and microbial pathways. Yet, Chou’s path to Cornell has been far from easy, spanning several continents, and combining years of unique experience in the wine industry. 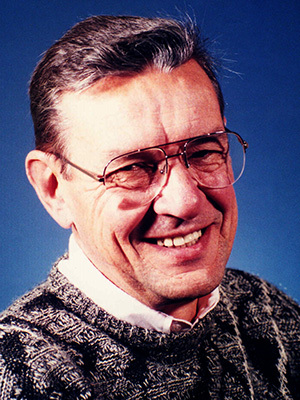 James Russell Hicks, an expert in vegetable storage and post-harvest physiology, died on November 26, 2015. He was 78. Hicks was an innovative teacher, producing videos in the ‘80s to illustrate different methods of grading and packing crops. He used the same technique while on sabbatical in Zimbabwe to train extension agents and farmers there in post-harvest practices. Hicks received his B.S. from North Carolina State University in 1960, his M.S. from the University of California-Davis in 1967, and Ph.D. from the University of Maryland in 1970, all in horticulture. He served as an assistant professor at the University of Florida from 1970 to 1975 before joining the Cornell faculty as an assistant professor in 1976. He had a joint appointment with the Institute of Food Science, and was praised for collaborations that crossed department lines. He was promoted to associate professor in 1981. In 1983, he and two of his former colleagues at the University of Florida split the $200 honorarium from the Council Memorial Tomato Research Award from the Florida State Horticultural Society. Their research showing that new standardized shipping containers not only prevented damage as well as containers commonly used at the time, but they also allowed growers to fit 11 percent more tomatoes on every pallet and in every truck. If widely adopted in 1983, the new containers would have saved growers $6 million that year alone. The research helped convince Florida tomato growers embrace the new containers, which they continue to use with minor modifications to this day. As our growing season comes to a close, we would like to gather community members for a celebration and reflection of this past season. A brief presentation will be accompanied by a light lunch and an open floor for conversation. 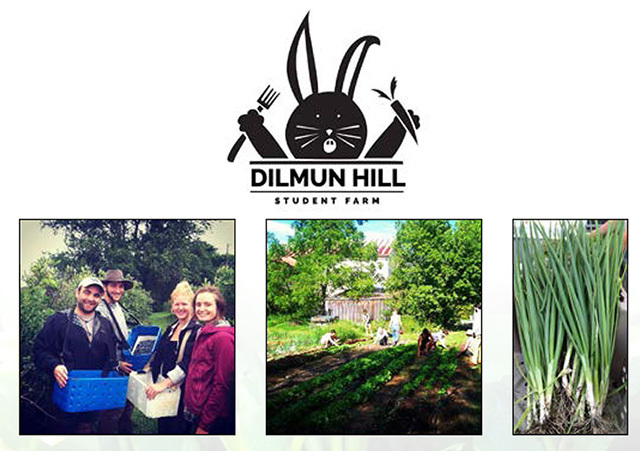 Dilmun Hill is Cornell’s student-run farm that has been practicing sustainable agriculture on Cornell University’s campus for more than a decade. Our mission is to provide students, faculty, staff and community with opportunities for experiential learning, group collaboration and research. More info.